TO PURCHASE and MORE COLORS & SIZES CLICK HERE! Vionic Tide II Toe Post Sandal features the same great comfort and fit you've come to love and expect! It's updated tread pattern and leather trim style will surely be iconic and best-selling just like its predecessor. This casual thong's contoured shape and shock absorption helps to stabilize and realign the feet when walking, minimizing foot and back pain. Proven to effectively alleviate heel pain. * Recommended by Dr. Andrew Weil. Foam-lined strap and soft woven toe post ensure a comfortable fit. 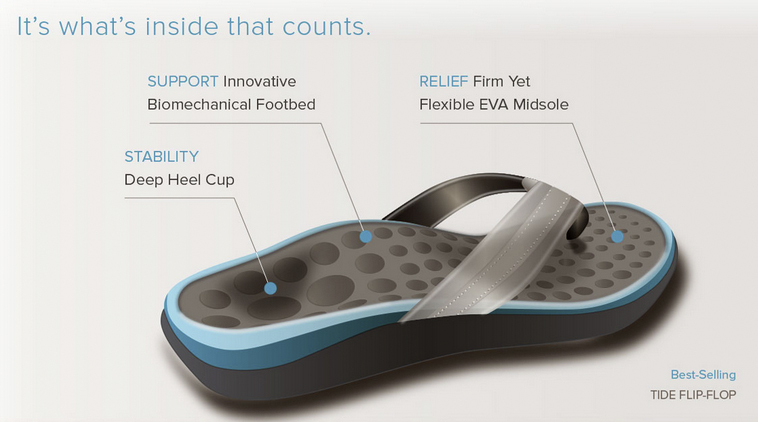 Shock absorbing lightweight, flexible medium-density EVA midsole reduces stress on feet, ankles and knees. APMA Seal of Acceptance awardee. We recommend you ordering the nearest size down if you are a half size. Wipe off with damp cloth to clean and air dry under indirect sunlight only. These sandals have helped my feet considerably. They are also very attractive.